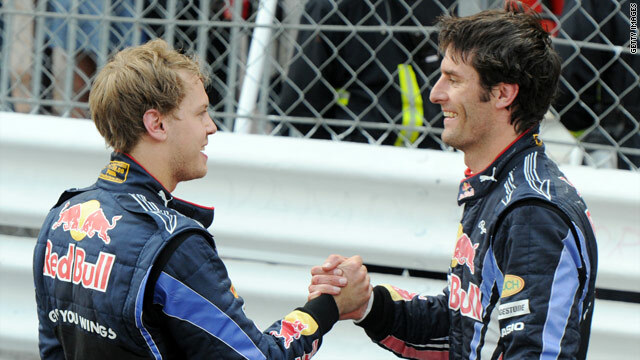 Red Bull insist the row between Mark Webber and Sebastian Vettel after their crash in Turkey is now over. (CNN) -- Formula One team Red Bull have held clear the air talks after the collision between drivers Mark Webber and Sebastian Vettel that cost them a chance of victory at the Turkish Grand Prix. Australian Webber was leading in Istanbul when second-placed Vettel attempted to overtake on lap 40 of 58 but the cars collided, costing both valuable points. Vettel span off the track and was forced to retire while Webber recovered to finish third after spending time in the pits. After the race, both blamed each other. Red Bull bosses called a clear the air meeting at their base in the UK on Thursday and emerged to insist the matter was now closed. Seb and I will make sure it doesn't happen again and will continue to work openly together. A statement on their official Web site read: "It was a positive meeting, which draws a line under the incident that happened on lap 40 of the Turkish Grand Prix. The team are now fully focused on next week's Canadian Grand Prix." Both drivers also expressed their regret at the incident. Webber, who still leads the drivers' championship by five points, said: "It's a shame for the team, as we lost a good opportunity to win the race. It's sport and these things can happen, but it shouldn't have done. "I feel for everyone at Red Bull, at the factory and everyone involved. Seb and I will make sure it doesn't happen again and will continue to work openly together, no problem. We have talked enough on it now, it's done, we're looking ahead and I'm focused on the race in Canada next week." Webber's teammate Vettel, who is currently fifth in the standings, added: "The team had got us into a great position and it wasn't good for them what happened -- so I'm sorry for them that we lost the lead of the race. "Mark and I are racers and we were racing. We are professionals and it won't change how we will work together going forward. We have a great team and the spirit is very strong. I'm looking forward to Canada." The next race is in Canada on June 13.